For a chunky dip, mix cottage cheese, yogurt and seasonings of your choice in a bowl. For a smoother dip, mash cottage cheese with a fork before adding yogurt and seasonings. For a smooth dip, blend all ingredients in a blender. 6 Comments for "Ranch Dip"
Kids loved this recipe. We made the dip in a blender, and made a fun veggie tray for dipping. I love using this recipe in my nutrition education classes! Kids love ranch and I like that I can show them a healthier version. After kids taste it, I often get a response like "this tastes even BETTER than ranch!" I would reccomend using a blender to smooth the cottage cheese. I've also tried other herbs such as dill and it's just as delicious! Great dip! It is my go to dip for classes. The only change that I made was to add dill weed. To the original recipe I add 1 tsp. dried dill weed. I thought this recipe was way too salty, so I added more yogurt, garlic, and parsley. It was a hit! Great idea! The salt is easy to reduce and only affects taste. Be sure to use garlic powder and onion powder instead of garlic salt or onion salt to keep the salt down. 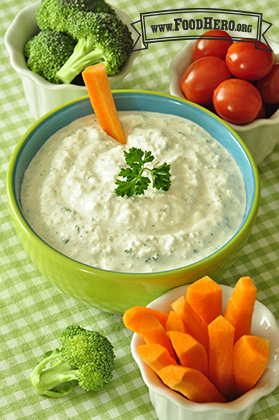 This healthy version of a Ranch Dip is a hit with kids. When they scoop their veggies in it, they have no idea they are actually getting a dip that is made with food group foods! To dress salad greens, I thin the recipe with a little low-fat milk.